Rival Gaming is a lesser known but excellent online casino software provider. 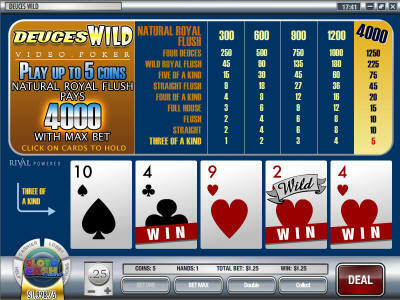 The company was established in 2006, and aims their software at the younger crowd of online gamblers. Rival Gaming casinos have sleek, modern graphics, great animations, and fast game play. Thrill seeking players will love a Rival Gaming casino, and especially Rival Gaming video poker machines. Rival offers all of their video poker games in one hand, four hand, ten hand, or twenty-five hand varieties, so you can have a shot at making a monster hand every time you deal the deck. Plus, the graphics are outstanding, as you'll see below. Like I mentioned, each game can be played in one hand, four hand, ten hand, or twenty-five hand variations. I recommend playing multi hand games if you want to reduce variance, because you're more likely to get the expected outcome for a specific hand when you're playing the same hand four, ten, or even twenty five times. The screenshot really doesn't do the game justice, because as you play the animations are really amazing and make the experience much more enjoyable. As you can see all of the payouts are at least 98%, and the Jacks or Better game tops the chart at a whopping 99.54% payout!